The Comet: What a day! 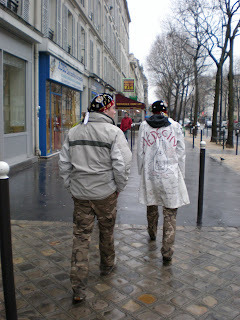 Yesterday there was a Parismus-party so I got home pretty late. And still I had to get up at 6.30 today because my lesson started at 8. But when my alarm rang, I was so tired that I thought that ok, I'll snooze just once and then I'll get up. Well, I guess you already guess what happened. In stead of pressing the snooze-button I had apparently pressed te disactivating button in stead! I woke up again at 7.28 and was like "SHIIIIT!!!!". And up I jumped, skipped breakfast and ran like a maniac to the metro-station. I'm pretty proud though, because I was actually down in the lobby of the residence at 7.34! So it took me only 6 minutes! :D And I even reached the university in time, even though I just can't understand how that's possible since it usually takes almost 45 minutes from door to door. But today, I made it in 25 minutes. And even though I hadn't slept for more than... umm... less than four hours, I didn't fall asleep during the lesson! Afterwards I went for breakfast with Liss, a canadian girl that I have the same courses with on fridays. But once I had had my cup of hot chocolate and was able to sit down, I started to get really tired. If the next lesson hadn't been as interesting as it was, I would probably had fallen asleep. You know what made it interesting? Not the history at all, because due to the strike we actually didn't have a real lesson. But in stead the teacher gave us some information about the strike and asked us what we thought about that, about the university, about history as a subject etc. And you should have heard the debate! Man, it was loud! Especially when they discussed history and the prospects for a historian. I have to tell all of you from Historicus who read this blog, that apparently a big part of the french students also has this very strong Cui bono?-mentality! :D It was just very amusing to listen to it, although I didn't understand all of it since they were talking very, very fast. 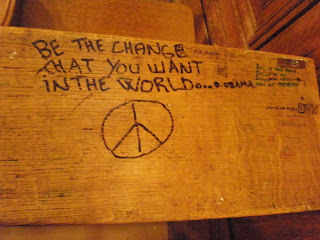 Clearly Obama has a lot of fans over here too :) This was written on one of the tables in a big auditorium.